On Wednesday, Cass Tech star and former Michigan commit Mike Weber took to twitter to announce that he had committed to Ohio State. I won’t lie; I was pretty surprised when Mike committed to Ohio State on Wednesday. Only four weeks ago, Mike reopened his recruitment during Michigan’s pitiful loss to Maryland, and there was rumblings that Mike would ride out the rest of the recruiting cycle and commit during the Army All American game on January 3rd. Weber, who does play a game similar to former Buckeye Carlos Hyde decided that committing to Ohio State was possibly the best way for him to showcase his talents at the FBS level. If your're the glass is half full type of person, good news. With Mike’s commitment to the Buckeyes, this almost seals the deal that talented 5 * running back and former Michigan commit Damien Harris will end up playing in the SEC on Saturdays, for either Kentucky or Alabama. So, what does this mean for Michigan? Well, with just under two months left to signing day, and no head coach yet decided, Michigan will most likely not take a running back in the 2015 recruiting cycle. The Wolverines currently have Derrick Green, Drake Johnson, Ty Isaac, and DeVeon Smith in the running back stable all with eligibility left, so taking a running back this year may not be the next coach’s first priority. 2016 features an outstanding crop of running backs with Michigan interest early on including; Kareem Walker, Elijah Holyfield, Kentrail Moran, Robert Washington, and Mathew Falcon. Weber becomes the third Cass Tech recruit in two years to commit to Ohio State joining; DB Damon Webb and OL Joshua Alabi. Mike rushed for 2,268 yards and 29 touchdowns as a senior last season. He is rated as the #8 running back, and #71 overall in 2015. On Tuesday, 2015 Cornerback Marcus Lewis released his Top 3, which did not include the Wolverines. I was a bit surprised to see Michigan had not made Marcus’s list. There was plenty of interest on both sides and Marcus was on campus last summer at the Big House BBQ. But when your school doesn't have a coach and won’t for the next few weeks, why would a recruit be interested anymore. After his decommitment from Florida in the summer, it looked almost certain that Lewis would end up dawning the Maize and Blue in college. Funny how just a few months can make or break a program when it comes to recruiting. Marcus has already scheduled his official visits to Kentucky for December 13th and Miami on January 16th. In October he visited Washington for his first official visit. Lewis is rated as the #17 ATH, and #165 overall in 2015 according to 24/7 sports. 2015 Safety commit Tyree Kinnel had an in-home visit from Notre Dame coaches Mike Elston and Brian VanGorder on Wednesday. According to ESPN’s TomVanHaaren he will also take a visit to South Bend this weekend. Former 2015 LB commit Darrin Kirkland Jr. will decide his college choice on December 15th. My best guess is that he will play his college football in Norman, Oklahoma. 2015 Defensive Back target Colin Samuel committed to UCLA on Tuesday night. 2015 Wide Receiver Grant Perry committed to Northwestern on Monday night. Grant, who is teammates with current Quarterback commit Alex Malzone didn't receive a scholarship offer from Michigan, but there was most definitely interest from the underrated Brother Rice receiver. 2016 Wide Receiver target Donnie Corley was offered by Ohio State on Monday. 2016 Quarterback commit Messiah deWeaver received a scholarship offer from Indiana on Friday morning. 2016 Tight End target Naseir Upshur released a Top 15 late last Friday that did not include the Wolverines. Upshur is rated as the #3 Tight End in 2016 according to Rivals. For up to the minute recruitment news, you can follow Travis Cooper on Twitter @MaizenBlueCoop. 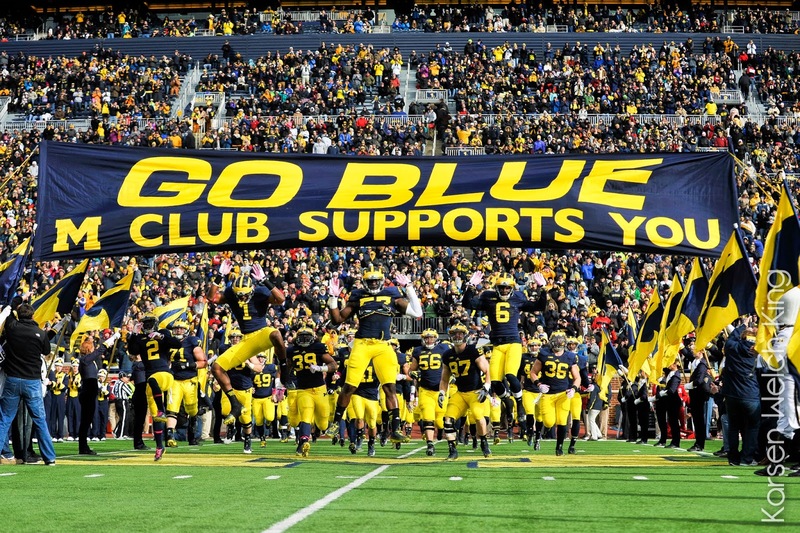 You can also follow Maize & Blue Nation on Twitter, Facebook, and Flickr.